Rube Goldberg (formally Reuben Garrett Lucius Goldberg) was an American cartoonist, engineer and inventor of the 20th century known for his political cartoons and manufacturing complicated devices to perform simple tasks. Goldberg was born in 1883 in San Francisco, California to Jewish parents, the third of seven children. He was interested in drawing since childhood and started tracing drawings at the age of 4. He formally took drawing lessons at the age of 11. Goldberg’s father, who was the San Francisco fire and police commissioner, encouraged him to pursue engineering. Subsequently, he enrolled in University of California, Berkeley from where he graduated in 1904. He worked as an engineer for the Water and Sewers Department of San Francisco but left six months later to join the “San Francisco Chronicle” as a sports cartoonist and later moved to another newspaper called the “San Francisco Bulletin”. Goldberg moved to New York in 1907 where he worked for five newspapers including New York Journal American and the New York Evening Mail. 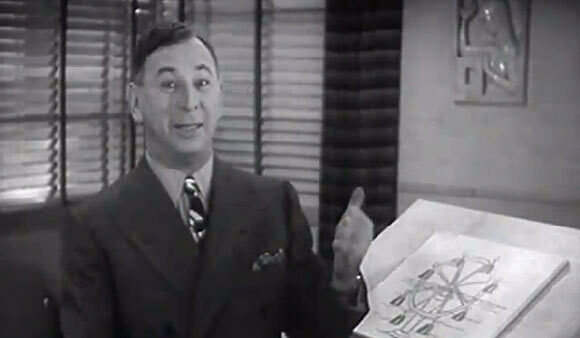 Goldberg’s cartoons earned him national fame. His cartoon strips included Mike and Ike (They Look Alike), Lala Palooza and The Weekly Meeting of the Tuesday Women’s Club. The most popular character that he created was “Professor Lucifer Gorgonzola Butts” who was his main claim to fame. In this comic strip, Rube displayed detailed illustrations of complicated machinery that was linked together to perform simple tasks such as opening a door or hammering a nail. His inventions were so famous that the dictionary now includes the term “Rube Goldberg” as an “ingeniously or unnecessarily complicated machine”. A Rube Goldberg Machine is the name given to any mechanical system that is elaborate and complex and used to perform simple tasks. Goldberg said that his inspiration for these machines was his fascination with technology and how people responded to it. He believed that people often take complicated approaches to solving simple problems rather than taking the direct route and making their own lives easier. He spent over 30 hours to perfect each drawing of the machines he illustrated in his comic strips. Goldberg was married in 1916 to Irma Seeman and the couple had two sons named Thomas and George. However, during World War II, when Goldberg began to receive threats and hate mail because of his incisive political cartoons, he insisted that his sons change their last name for their safety. Both sons chose the name of George. One of his sons grew up to be a painter and the other became a Hollywood writer and producer. They formed a company called “RGI” (Rube Goldberg Incorporated) which is now run by his grandchildren. The company holds contests for aspiring engineering students where they are required to design Rube Goldberg machines. Goldberg won the Pulitzer Prize in 1948 for a cartoon about nuclear devastation. He was the first president of the “National Cartoonists Society” and the prestigious “Rueben Award” has been named in his honor. He also started sculpting after his retirement from the New York Journal in 1964. Goldberg wrote a film script demonstrating his machines and sculptures. It was called “Soup to Nuts” and was released in 1930. Various other films demonstrate Ruben Goldberg Machines including “Edward Scissorhands”, “Back to the Future”, “The Goonies” and the popular cartoon show “Tom and Jerry”. The popular board game “Mousetrap” is inspired by his work. Goldberg died in 1970 at the age of 87 in New York. His legacy is continued by his grandchildren and like minded engineers and cartoonists all over the world.